Anti-Semitism is widespread throughout the Arab and Muslim world, manifested in many segments of society. The Anti-Defamation League monitors and documents anti-Semitic cartoons and articles, which appear daily in the Arab media. 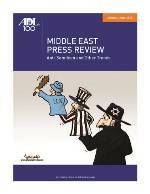 This publication is the latest compilation of select anti-Semitic and thematic caricatures and articles in the Arab and Muslim media, and includes examples from January-June 2013.